Costa Rica is an adventurers paradise. There are rivers to raft, waves to surf, jungles to explore and plenty of volcanoes to climb. Determined to do it all during my short 2 weeks traversing this Central American country, I found just the right volcano to hike. Located outside the town of La Fortuna in northern Costa Rica, quietly waiting in the shadows of famous Arenal Volcano sits Cerro Chato. This volcano hike took me straight up its steep sides though lush (but humid) jungle, and ended with a beautiful view looking down into a crater lake. Arenal Volcano on Laguna de Arenal. What attracted me most to this hike was that I could bring my bathing suit and go swimming in the crater lake! This was a much needed reward after a hard, hot 2 hr hike. Due to the humidity, I was told its best to begin this trek early in the morning. My boyfriend K and I left at 8 am with a group from our hostel and actually met people coming back down who had started much earlier. Arenal Volcano beside Cerro Chato’s crater lake. The hike begins at the Green Lagoon Info Center (part of the Green Lagoon Falls Park and Lodge) were we had to sign in and pay a fee of $10 as we were entering the private Arenal Nature Conservancy Park and Gardens. To get there, we took a taxi from our hostel which dropped us off right in front of the center. The hike started out on a beautiful grass trail, passing amazing local flora. We trekked by cows grazing in the fields and took short breaks to admire the breath taking views of the town and beyond as we ventured higher and higher. Just under half way up there was a dramatic change in scenery as the grass fields give way to dense jungle. And this is where the hard work began….. A crud “jungle staircase” lead us up, up and up the volcano! It got very damp and humid in the jungle, so we had to pace ourselves and take plenty of breaks to rest and rehydrate. Once at the top we had a spectacular view of Arenal Volcano, though the peak was covered by cloud, and we were able to peer down into the crater lake of Cerro Chato. From there it was a steep climb down more stairs, about 200 m, that took us right to the edge of the crater lake. Dripping in sweat, we jumped into the cool waters of the lake and savored the experience of swimming in a volcano! While we did this hike on our own with no issues, you can sign up for a guided hike through many of the local tour operators if you prefer. The trail is very obvious and the jungle so dense that you really can’t go off the trail. As an added bonus, once we returned to the parking lot we walked just a few hundred meters down the road to find a beautiful waterfall with a pool to swim in (the trek back down Cerro Chato left use sweaty and hot once again). La Catarata de la Fortuna is a gorgeous 70 m waterfall that drops down into a large circular pool where we could go swimming. There was another small fee to pay at the entrance and we stopped at a nice viewing platform that gave an incredible view of the waterfall and lush, dense jungle. From there we descended a long steep staircase down to the bottom of the waterfall. Once at the bottom, we left the trail and had navigate over huge boulders to get to the edge of the pool. There was also a small creek that runs off the pool that we explored and found lots of fish swimming around in. 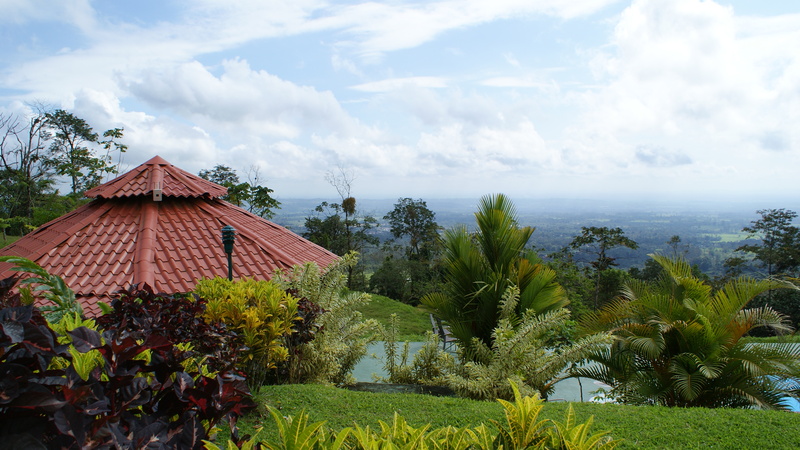 Costa Rica has so much to offer to anyone willing to go on an adventure. Where else can you hike and volcano and go swimming under a massive waterfall all in one day? Getting There: You can catch a bus from San Jose to La Fortuna which will take approximately 4 ½ hrs. From your hotel/hostel in La Fortuna you can hire a taxi to drop you off at the Green Lagoon Info Center and will only cost a few dollars. Cost: $10 payable at the sign in center. They also ask that you sign out after your finished the hike. Time to allow: Generally speaking this hike takes about 2 hrs each way. This will depend on your fitness level as my group conquered it in 1 ½ hrs. If you’re planning on swimming, allow an extra 1-2 hrs, especially if you’re going to have an early lunch. Useful Hints: Start early! The earlier the better. 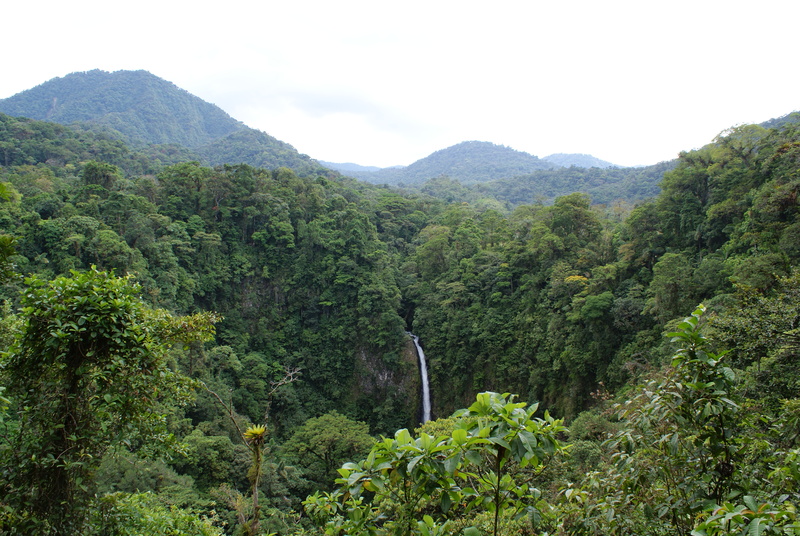 Costa Rica has a very humid climate and this is a particularly difficult hike. You will be sweating through your clothes before you reach the jungle. Pack LOTS of water and snacks, there is nowhere to purchase these items along the way. Pack your swim suit and towel if you plan on swimming. Some say the crater lake is very acidic and you shouldn’t swim in the water. I had no issues after swimming here and fish live in the water so, hey, it couldn’t be that bad right?